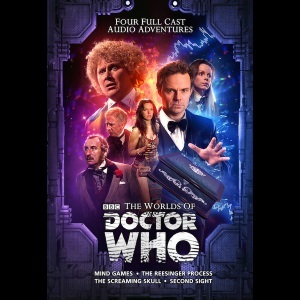 To mark the fifteenth anniversary of the Doctor Who licence, Big Finish released the four-disc connected set of stories The Worlds of Doctor Who. It should celebrate and not just be very good. I have taken artwork from the Big Finish forum for the four stories. It was produced by davidspofforth. 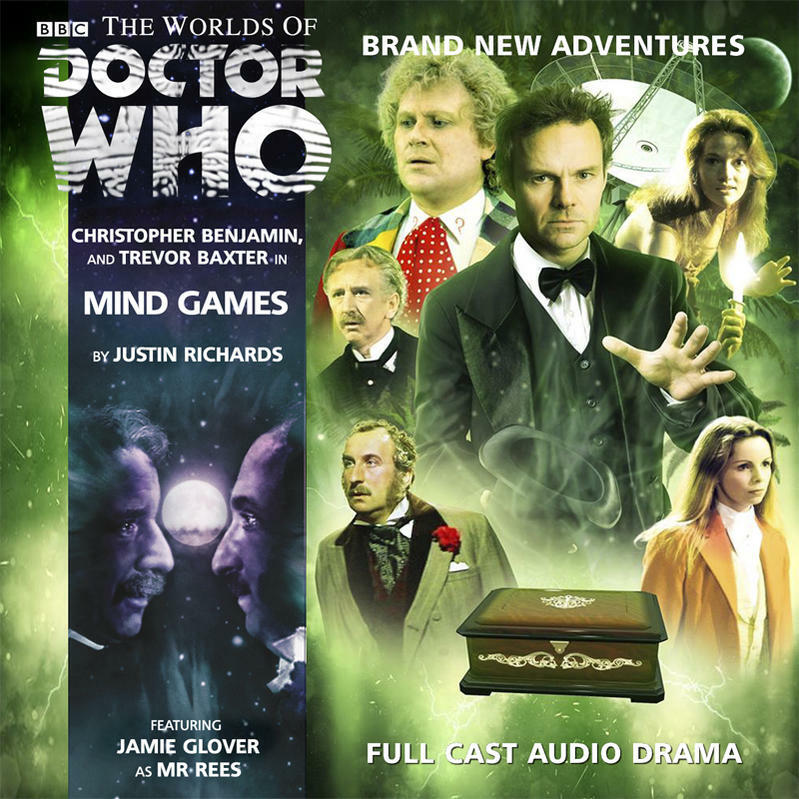 First up is the world of Jago & Litefoot in the Justin Richards story Mind Games. In some respects this is a trimmed down slice of Victorian adventure with brief appearance from secondary characters and then straight down to investigating the mysterious Mr Rees a mesmerist who just happens to be one of Jago’s acts at the New Regency Theatre. The story comes to a resolution and sets up links to later stories without them feeling like loose ends. It did feel over too quickly thought this may just be because it was such fun to have the characters even for just one story. Justin Richards also penned the second story, The Reesinger Process a tale for the Counter Measures team. It is a testament to the development of this branch of the Big Finish who-niverse that this story works really well and manages to both refer back to Mind Games and have a decent enough setup that tells its own story. This is the only one of the four stories with new cast – Sinead Keenan and her brother Rory as brother and sister who are exercising their influence as they seek to locate a certain well under what was bombed out London. The story builds up the power of Mr Rees in a credible way and hands the baton on nicely. Jonathan Morris takes over for The Screaming Skull which adds Mike Yates to his own Vault stories (Tales from the Vault and Mastermind) from the Companion Chronicles range. This also unlocks the central characters Matheson and Sato last seen on their way to permanent incarceration. Along with an action packed story we also have links back to the first two tales, another alien, dark alien powers and more references to other stories than I can list. I can’t find anything to dislike and even the sound punches up an extra level on this story. Last, and in some ways least, is the Gallifrey series marked by Romana II and Leela in a Nick Wallace / Justin Richards story called Second Sight. 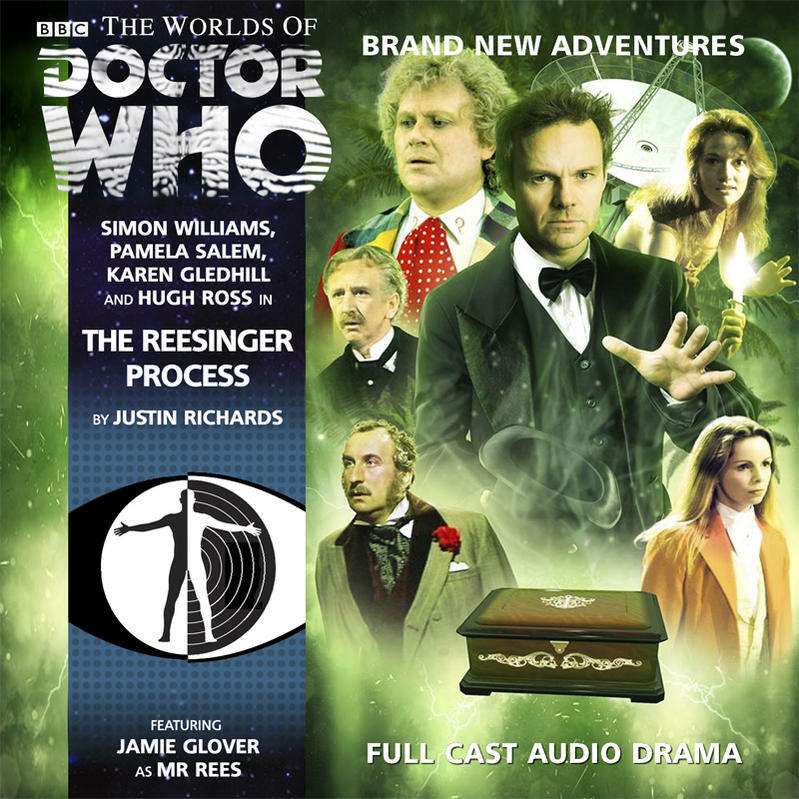 Into this add the Sixth Doctor and we find out that the powers of Mr Rees have an almost unlimited potential to cause trouble on a planetary scale. There is much discussion over the limits of time travel and travelling by TARDIS (telepathically) into mental constructs. Louise Jameson gets to lay a possessed Leela aka Miss Sevateem, a fun idea but sadly as Leela herself she does less than normal. The story flows well but conveys no real sense of the Gallifrey stories that I can spot. Even with some reservations over Second Sight the set works well and the central villain becomes a flavour of each story without robbing any of them of their own identity. I liked the way a wax cylinder recording of Jago and Litefoot cropped up in later stories along continuity to Counter Measures. Using Colin Baker who has also been in Jago & Litefoot is also strong concept that works very well. This celebrates the wider meaning of Doctor Who to Big Finish. Were you to pop a copy of this back in time to 1999 for Nick Briggs et al. to hear I think they’d be astonished and need convincing that this would be the level of success they would have following on from the first steps with Sirens of Time. You could complain that things have been left out, that more Doctors could have been used but don’t forget (as David Richardson reminds us) we have Light at the End last year. This is its own thing and really does celebrate to a large degree, everything Big Finish has done. Here’s to Big Finish then, and the next 15 years (and more)! ← Back Into the Dalek for Legacy!